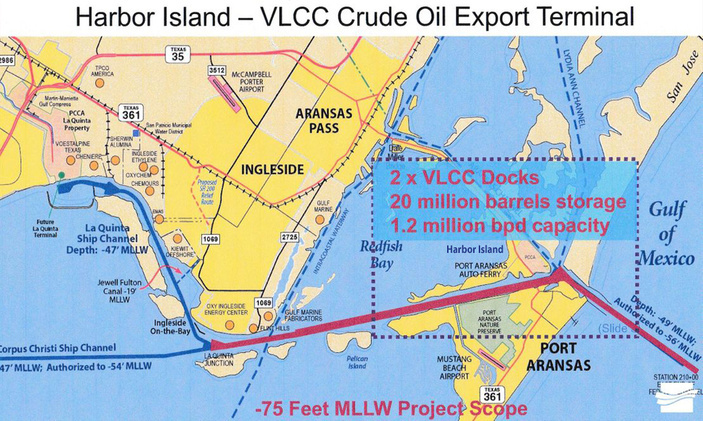 The Port of Corpus Christi plans to use 200 acres of land on Harbor Island for a deepwater marine terminal to accommodate Very Large Crude Carriers to fully load with oil and gas products from pipelines leading to the island. Map courtesy of Port Aransas Conservancy. A judge stopped the Port of Corpus Christi Board of Commissioners from voting on a Harbor Island lease that could net $2 billion to $4 billion in revenue over the 50-year life of the lease. Commissioners were set to vote on the lease at their Tuesday, March 19, meeting when they learned that the 13th Court of Appeals granted a temporary restraining order on the move. The court ordered that no action could be taken until the court case is settled. The stay was requested by former port Commissioner Kenneth Berry, president of The Port of Corpus Christi LP, who started his action with County Court-at-law Judge Mark Woerner on March 18. Berry accuses commissioners of violating the Open Meetings Act in negotiating a lease of 200 acres of property on Harbor Island in Port Aransas. He said commissioners have kept the process under wraps, violating the public’s right to know. The proposed lease on the March 19 agenda is between the port and Lone Star Ports LLC, a joint venture between the Carlyle Group and Berry Lone Star Ports LLC. Lone Star Ports wants to build a marine terminal, pipelines, a petroleum storage facility, and two new docks capable of handling Very Large Crude Carriers, which can hold up to 2 million barrels of crude. It would be the first onshore location in the United States able to dock and load the bigger ships now used to import and export oil and gas products. The project was first announced in October 2018. At the time, completion was estimated in late 2020. Carlyle’s money would come from its Global Infrastructure Fund. The next step at the time was to get approval from Carlyle’s investment committee. That seems to be accomplished now that a final agreement is slated to go before commissioners for a vote. The proposal has met with opposition from more than Berry, who is being sued by the Port of Corpus Christi over his use of the name Port of Corpus Christi LLC for his company. The name was approved by the Texas secretary of state in 2014, a decision that was reversed in 2018 at the Port of Corpus Christi’s request. The secretary of state’s office said it made a mistake. Berry did not change the name, however, so the port filed suit in April 2018. The Port Aransas Conservancy, a nonprofit advocacy group, has publicized its opposition through public meeting statements, newspaper advertising, and letters to officials. The Berry Group is the largest private employer in the Corpus Christi area. It has numerous investments and operations in the oil and gas industry along with its subsidiary Bay Ltd., an infrastructure, construction, and fabrication contractor headquartered in Corpus Christi. The Berry Group is led by directors Marvin Berry, Dennis Berry, and Lawrence Berry. The port awarded two contracts in December to begin work on a marine storage terminal and put in the electrical infrastructure needed for the Harbor Island facility. So Ken Berry (former commissioner of the port, and president of the poorly named Port of CC company) sued to stop progress on the job by Carlyle and a company with three other guys named Berry ? So does Ken have a competing plan for port expansion that favors his company....and are these guys all related ? This story could tell us so much more ! False statement in the article. This would not be the first dock capable of loading VLCCs. Moda Midstream currently loads them in Ingleside.